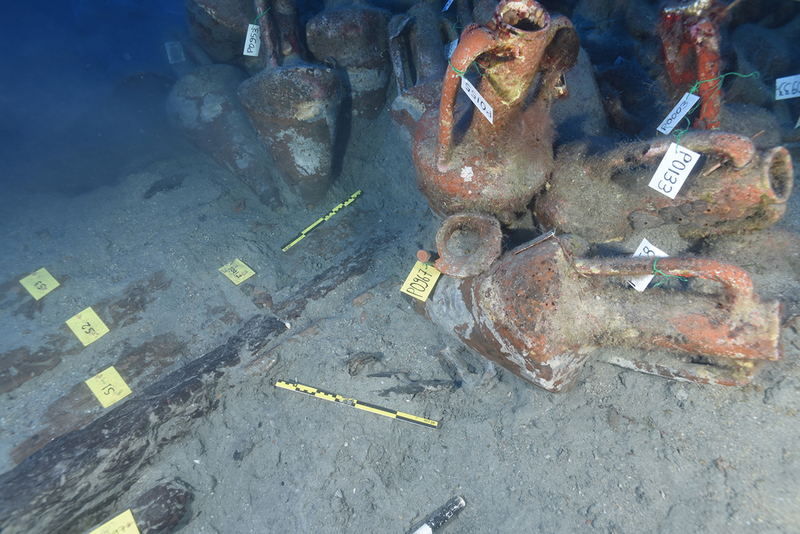 A total of seventy (70) partly or fully preserved Chian amphorae were recovered, which raised the number of amphorae stowed under the foredeck of the ship’s hold to ninety nine (99). The seventh full excavation season at the 4th century BC Mazotos shipwreck was successfully completed, after four weeks of intensive fieldwork (20 September -21 October 2018). The project is conducted by the Maritime Archaeological Research Laboratory (MARELab) of the Archaeological Research Unit, University of Cyprus, in collaboration with the Department of Antiquities of Cyprus, under the direction of Dr Stella Demesticha, Associate Professor in the Department of History and Archaeology. The photogrammetric mapping of the site was coordinated by Dr Dimitrios Skarlatos, Assistant Professor in the Department of Civil Engineering and Geomatics, Cyprus University of Technology. The objective of this year’s field season was to continue and complete the excavation of the bow area of the ancient ship. A total of seventy (70) partly or fully preserved Chian amphorae were recovered, which raised the number of amphorae stowed under the foredeck of the ship’s hold to ninety nine (99). Most of these amphorae were most probably carrying wine but at least one was full of olive pits, possibly for consumption by the crew. Also, two fishing weights were found, which offer us a glimpse of the life onboard the merchantmen of the period. Underneath the cargo, the wooden hull was poorly preserved, most probably (as a result of the wrecking episode and (the subsequent natural site formation processes at play. Only two days prior to the end of the season, a much better preserved part of the hull began to appear, which is a promising indication that more coherent evidence on shipbuilding technology will be found during the next field season. After careful study of the excavated timbers, however, a very important element of shipbuilding technology has already come to light: both ligatures and mortise-and-tenons were used to join the garboard, the stempost and the keel. Related with the traditions of two prominent Mediterranean seafaring people, the Greeks and the Phoenicians, these two techniques found in the same ship add an important piece to the puzzle that is the history of classical shipbuilding in the eastern Mediterranean. This history has thus far been grounded on only two excavated shipwrecks: the Ma’agan Michael, Israel, dated to the end of the fifth century BC and the Kyrenia shipwreck, Cyprus, dated to the beginning of the third century BC. Thus, the Mazotos shipwreck, dated to the fourth century BC, fits right between these two and covers a gap in the development of naval technology in antiquity. The research team was comprised of 43 members (archaeologists, divers and students), most of them volunteers from Cyprus and eight different countries: Greece, UK, Spain, USA, Italy, Slovenia, Poland and Germany. The project was funded by the Honor Frost Foundation, CYTAVISION, the THETIS Foundation and the University of Cyprus.